The Agora Garden skyscraper is a a plant-covered twisting tower shaped like a DNA strand by Belgian architect Vincent Callebaut in Taipei, Taiwan. 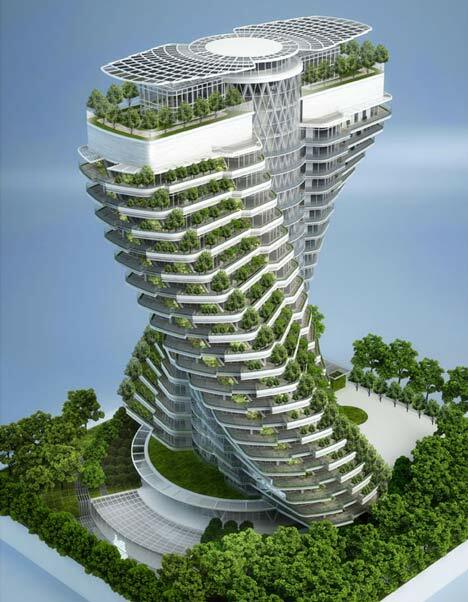 Described by Vincent Callebaut as neither single tower, nor twin towers, the 20-storey Agora Garden apartment block is designed with a double-helix structure that twists up around a fixed central core. Different from the modern city built of concrete, glass and steel, the Agora Garden tower appears in an urban centre as a green twisted mountain, Balconies on each floor will be filled with plants, vegetable gardens and fruit trees, creating a cascading layer of greenery across the exterior. These will enable residents to grow their own food and compost all their biodegradable waste. On this site that is the last and only biggest parcel of land for residential use, the concept is to build a true fragment of vertical landscape with low energetic consumption. The building is thus eco-designed. It integrates not only the recycling of organic waste and used water but also all the renewable energies and other new state-of-the-art nanotechnologies (BIPV solar photovoltaic, rain water recycling, compost, etc.). The project targets thus the energetic performance so as to be officially approved by the Green Building Label, the norm for high environmental quality, delivered by the Home Affairs Ministry of Taipei.